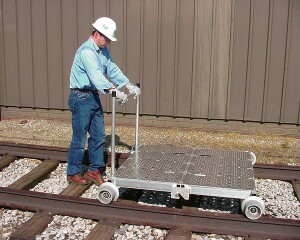 The photo shows a ATS-1B tool and supply cart. The ATS-2B cart would have 8-inch wheels. Nolan’s aluminum cart weighs only 98 lbs., but handles loads up to 5,000 lbs. NEW FEATURE! Now handles loads up to 5,000 lbs. NEW FEATURE! Cart can be pushed in either direction without removing it from the track by simply detaching the handle from one end and inserting it into the other end of the cart. Both ends of the cart have parking brakes, providing stability and safety on track grades and during loading/unloading operations. Ergonomic handholds in deck surface allow easier handling during assembly. Heavy-duty aluminum deck is perforated to reduce the chance of load shifting, and is fully welded at all seams. Deck platform reaches above wheels allowing easier loading/unloading and smooth transporting of oversize materials.